A BLM Alaska Fire Service helicopter carries supplies to firefighters working on fires within the Alatna Complex. Most supplies are delivered via sling loads that are carried in by helicopters. Before the supplies are broken into sling loads they are first delivered to the Allakaket airport, then separated based on where they are to be delivered. July 5, 2016 (ALLAKAKET, Alaska) – Fire officials have determined that additional crews are needed to accomplish the objectives set forth by the agencies involved. On Monday, the Alaska Division of Forestry’s Gannett Glacier Type 2 Initial Attack (IA) crew was inserted onto the Chebanika Creek Fire (#364) to begin assessing work to be done to secure the fire from growing towards or affecting sensitive Sheefish spawning ground and caribou over wintering habitat. The BLM Alaska Fire Service North Star Type 2 crew has completed structure protection on a cabin in the vicinity and assessed the nearby allotment. Firefighters on the line will be taking extra precautions to ensure that the critical habitat areas will not be impacted by their presence in the area. The lightning that occurred in the Allakaket area Sunday night ignited a new start approximately three miles to the northeast of town. The Alatna Complex management organization was tasked to respond to the Tabeascot Lake Fire (#394). Four firefighters were flown in to work the 1/5 acre fire burning in peat. The fire was called contained at about 4 p.m. Monday and will continue to be monitored by those working on the complex. 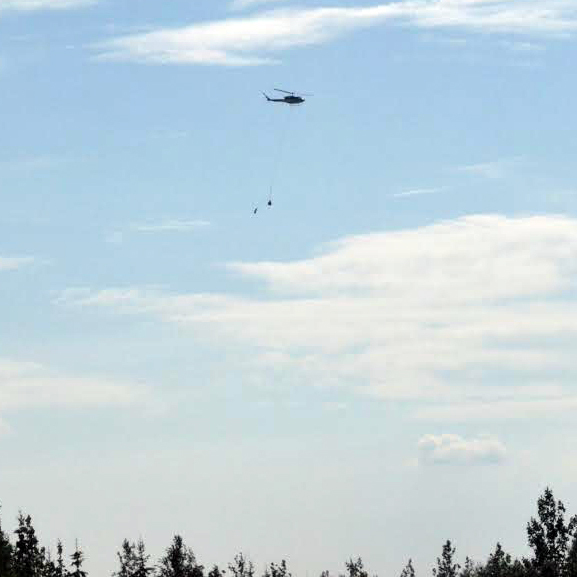 The four crews on the Siruk Creek Fire (#342), AFS BLM’s Chena Interagency Hotshots, Chugachmuit’s Yukon Type II IA, and EFF crews from Hughes and Allakaket were able to make good process over the weekend. The southwest perimeter is secure and the northern flank is nearing completion. Firefighters will continue to secure the remaining perimeter by extinguishing hotspots and mopping up areas of concern. The remaining three fires Bergman Creek (#323), Norutak Lake (#335), and Hogatza River (#337) are in monitor status. Fire officials will continue to observe the fires with aircraft as weather and aviation resources allow. Although Allakaket has experienced intense thunderstorms and received a considerable amount of rain the last few evenings, little to no precipitation has fallen on the staffed fires. More lightning and thunderstorms are predicted over the next couple days and the crews are ready to hunker down to stay dry and safe if the storms move over them. All fires in the complex are accessible by air only. Therefore, firefighters assigned to the fires are flown in and then supported by aerial resources. Most supplies are delivered via sling loads that are carried in by helicopters. Before the supplies are broken into sling loads they are first delivered to the Allakaket airport, then separated based on where they are to be delivered. There are approximately 25 personnel staged in Allakaket to help support the field operations including numerous local community members. The most up to date information and maps of the Alatna Complex Fires is available online at http://www.akfireinfo.com and will be posted in the Allakaket and Alatna Tribal Council buildings, as well as the Allakaket school and store. For information about fires statewide, visit http://www.akfireinfo.com or call the Alaska Interagency Information Center at 907-356-5511. In addition, you can follow the BLM Alaska Fire Service on Facebook.